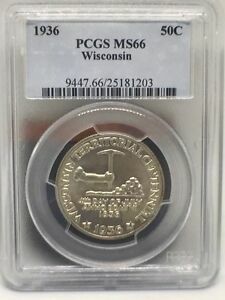 When collectors are asked to identify their favorite U.S. commemorative coins, the answers given frequently include titles such as Oregon Trail, Panama-Pacific, Gettysburg and California Jubilee. Rarely heard, if at all, is the name Wisconsin. 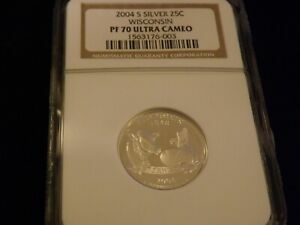 Having neither an attractive design nor any unique features, to many collectors it seems just one of those coins needed to complete a type set. 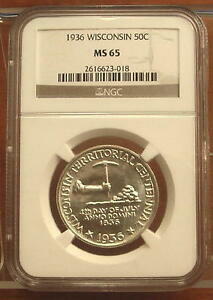 Yet, all commemoratives tell a story, whether it be about the theme depicted or about the coin itself. 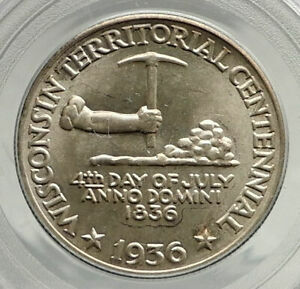 In this respect, the Wisconsin Territorial Centennial half dollar is fully equal to its peers. 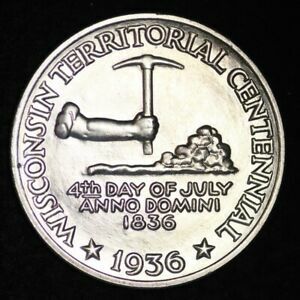 As the name implies, this issue marks the 100th anniversary of Wisconsin's achieving territorial status within the United States, an event that occurred in 1836. It didn't become an actual state until 1848. Long before these developments, however, Wisconsin was a little-known frontier, a temporary home to trappers passing through in search of beavers and other animals bearing desirable pelts. These trappers, and the missionaries who followed, were primarily French, as this land was then a part of New France. Ceded to Great Britain following the French and Indian Wars of the mid-18th century, Wisconsin later passed to the infant United States as part of Britain's settlement after the War of Independence. Largely ignored, Wisconsin attained greater importance to Americans when threatened by another war with Britain from 1812-15. In the 1820s, large deposits of lead were discovered in the southwestern part of Wisconsin, which by then was included within the Michigan Territory. The new mining industry brought a flood of prospectors to complement the established fur trade. As the number of white people in the region grew, conflict with the native population was inevitable. In a series of engagements known collectively as the Blackhawk Wars, these inhabitants were either subdued or driven away. Now important enough to be a territory in its own right, Wisconsin was so named in 1836. Its first governor, Henry Dodge, assumed his office on Independence Day, July 4. The centennial of this event in 1936 was marked by a number of celebrations around the state. 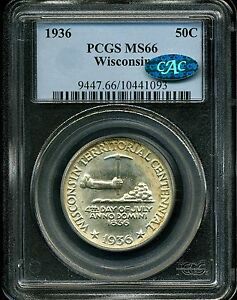 Almost as an afterthought, the Wisconsin Centennial Commission appointed a Coinage Committee to seek a commemorative half dollar, sales of which would aid in funding various activities associated with the anniversary. 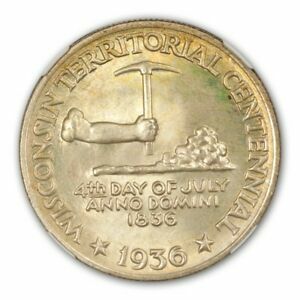 The bill approving this issue was not passed until May 15, 1936, and it included two other commemorative coins marking the centennial of Bridgeport, Connecticut and the tercentenary of Swedish settlement in Delaware. 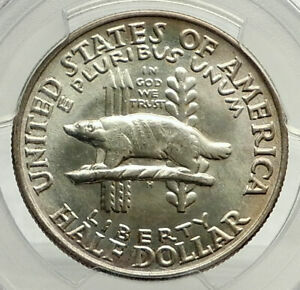 All three coins recognized events of purely local or regional significance and were scarcely worthy of commemoration on U.S. coinage, yet this was 1936, the peak year for promoting such issues. 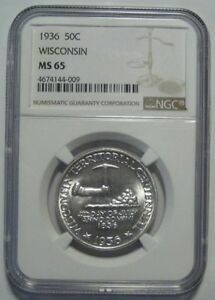 Wisconsin's Coinage Committee had already chosen a young university art student to prepare models based on their concept. This included the territorial seal on one side and a badger (part of the state seal) on the other. David Parsons' models, however, were unacceptable to the Mint, since they were in very high relief. Asked by the committee to name a suitable replacement, the Mint referred the matter to the Commission of Fine Arts, which recruited sculptor Benjamin Hawkins of New York. Given just three weeks to complete his models, Hawkins proved up to the task. They were submitted to the Mint on June 3, 1936 and approved by the Commission of Fine Arts two days later. 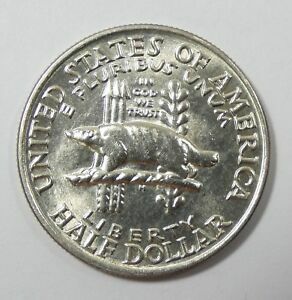 The obverse of the Wisconsin half dollar depicts a badger in profile, facing left and perched upon a log. Behind it, arranged vertically, are three arrows, symbolizing the three engagements of the Blackhawk Wars, and an olive branch, denoting the peace which followed. The statutory motto IN GOD WE TRUST is crowded into the space between these symbols. E PLURIBUS UNUM and LIBERTY are arranged in arc form above and below, respectively. UNITED STATES OF AMERICA and HALF DOLLAR are inscribed around the periphery. Hawkins' small initial H is below the log. 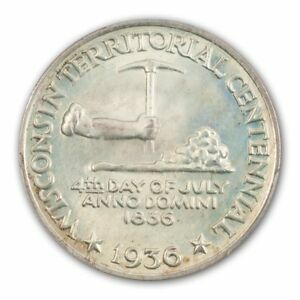 The reverse depicts the old territorial seal, with a disembodied arm holding a pickaxe suspended above a pile of lead ore. The inscription 4th DAY OF JULY ANNO DOMINI 1836 is arranged in three lines (the Latin part seemingly unnecessary). 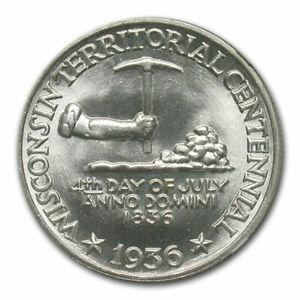 Encircling the periphery are the legend WISCONSIN TERRITORIAL CENTENNIAL and the date 1936, these separated by stars. 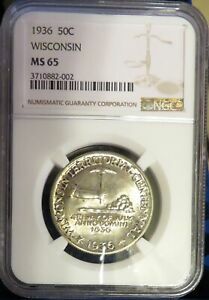 The legislation for this coin specified a minimum mintage of 25,000 but no maximum. 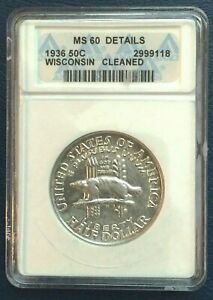 The Centennial Commission wisely opted to take a conservative course, and just 25,015 pieces were coined at the Philadelphia Mint in July of 1936 (the odd 15 coins were reserved for assay and were later destroyed). 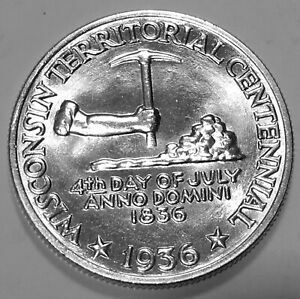 As the Wisconsin Centennial celebration at the state capital of Madison ran from June 27 to July 5, it's doubtful that any coins were available at that time. 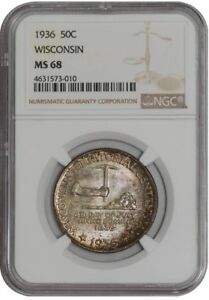 Advance orders may have been taken there, as Q. David Bowers related that a number of coins were sold during the fair. 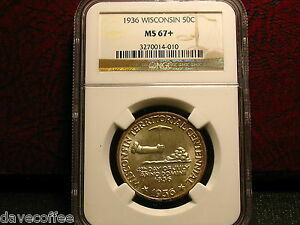 Most, however, were likely sold through the efforts of the Coin Committee, which offered them by mail at $1.50 apiece. This body was announcing their sale as early as April, before the enabling act had even passed! Due to their late arrival and limited appeal outside Wisconsin, sales were less than stellar, and huge quantities remained unsold at year's end. Ten years later, these coins could still be purchased from the State Historical Society at the discounted price of $1.25 per coin when ordered in groups of ten. By 1952 the remaining specimens had been raised in price to $3, plus postage. This supply was eventually exhausted sometime during the 1950s. Due to its prolonged distribution, small hoards of Wisconsin halves were accumulated and may still exist. 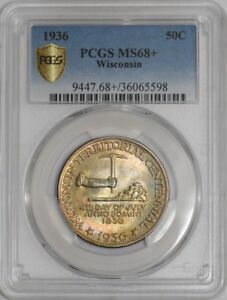 As so many coins of this issue were apparently sold to collectors and speculators long after 1936, nearly all Wisconsin halves are in mint state; coins grading EF-AU are seldom encountered. Examples in grades MS-60 through MS-65 are easily located, although the latter carries a large premium over lesser grades. Many specimens will show abrasions, contact marks, slide marks (from coin albums), the effects of harsh cleaning and other flaws which detract from their desirability. Points to check for wear include the miner's hand and the badger's shoulder. 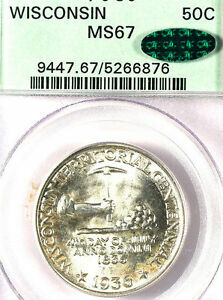 Unlike many commemoratives coined during John R. Sinnock's tenure as Chief Engraver, no proofs have surfaced of this design. Sinnock was a connoisseur of such pieces and usually had one or two made to his order; these may yet turn up. If they do, they'll likely be of the dull, matte finish that he favored. 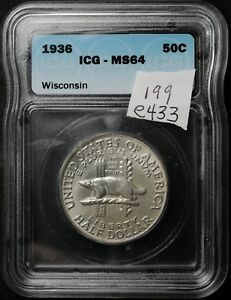 Wisconsin halves were sold primarily by mail and were shipped in generic, cardboard holders that contained slots for up to five coins. Apparently, no literature accompanied the coins, nor were the holders themselves printed. Orders of just one or two coins were wrapped in tissue paper and shipped in envelopes that were imprinted L.M. HANKS, FIRST NATIONAL BANK BUILDING, MADISON, WISC. or were rubber-stamped AFTER 10 DAYS RETURN TO STATE SUPERINTENDENT, STATE CAPITOL, MADISON, WISC. These envelopes are collectibles in their own right.